28.08.2014: A Green Revolution for Africa? - How to boost the productivity of African agriculture? Berlin - INISA e.V. A Green Revolution for Africa? - How to boost the productivity of African agriculture? Agriculture continues to be Africa’s most important economic sector and provider of employment. Decades of neglect, lack of investment, and insufficient knowledge transfer led large parts of African agriculture to suffer today from low levels of productivity. Increasing amounts of Foreign Direct Investments in land and agriculture currently threaten to further marginalize African small-holder farmers. The question of how to increase productivity of agriculture in Africa, including all groups of small-holder, emerging and commercial farmers, takes center stage for the sustainable development of the continent. The discussion will be in English. Please note that registration is necessary. See invitation for further details. We are looking forward to receiving your registration by 27 August 2014. Please, confirm your participation on the following Website. What kinds of investment are needed? How should knowledge transfer and capacity building be organized? What can be learned from the Green Revolution in Asia? 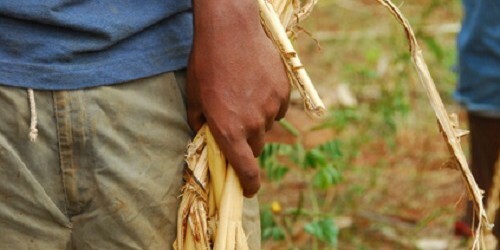 Does Africa need its own Green Revolution? German Development Cooperation intends, according to the new Africa Policy, to contribute to the strengthening of agricultural value chains in Africa. Which role can the 10 „Green Centres“, to be financed by the BMZ and implemented in cooperation with German Agro Business, play in this regard? How can the planned 10 vocational training centres for rural development contribute towards this end and how will the cooperation with the German private sector look like? INISA and Konrad-Adenauer-Stiftung bring together experts and the interested public in order to enhance the debate on key preconditions and challenges for sustainable development of the agro-sector in Sub-Saharan Africa. 15:00 h Panel Discussion: How to boost the productivity of African agriculture? Initiative Südliches Afrika (INISA) e.V. Aggrey Agumya: The right Framework for African Agricultural Productivity"